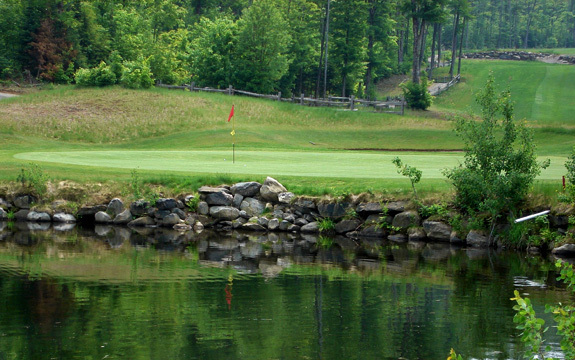 Muskoka golf is synonymous with stunning vistas, granite outcrops and dense tree-lined fairways. It’s also well known as a pampered golf experience leaving you wanting to bring your financial advisor along and prepare for a second mortgage. If beautiful views and the challenge of Muskoka golf sans the steep cost is more to your liking, this little jewel just outside of Hunstville is worth a try. Hunstville Downs is located just northeast of Highways 60 and 11. 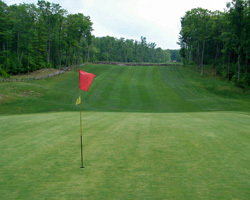 This rugged par 72, 18 hole layout has a blends old and new for a reasonable price. Visually, the facility has the aura of an earlier era. Huntsville Downs has all the modern amenities, but you can easily sense the 1925 roots of the course in the wood paneled clubhouse and line of Muskoka chairs on the porch overlooking the first tee. The feeling is more persimmon than titanium. The course is a wonderful test of golf that requires even the low handicapper to use all the clubs in the bag. The tight fairways and abundant water hazards really favour the shot maker. Even from the 6270 yard back tees with a slope of 129, an erratic driver will not be rewarded if you want to score low. Hitting fairways and greens is a must here. The longer and tighter front nine challenges from the first shot. The fourth hole, handicapped #1, is a serpentine par 5 that is truly risk–reward. The par 3 fifth, is a downhill beauty playing to 178 yards and carry all the way. If your swing is the least bit awry, bring out the ball retriever for holes six to nine. Ponds, streams and wetlands abound. The back begins with a green-site that every course should have. A fronting pond and rock wall forces you to finesse a short club for that birdie try. Photogenic hole 13 is a par 4 that dramatically drops from tee to green with sand and water guarding the target. Signature 17th is more of a downhill ski slope than a typical par 5. The stunning view from the elevated tee gives you a truly mountain golf feel. A rock wall separates the fairway about 170 yards out and the elevation change gives you a great opportunity for an eagle putt. The course is in good shape, with consistent green speeds and full carpets of fairway, (if you could be straight enough to hit them that is). The staff was very friendly complimenting the overall great value. It was a remarkable step back in time for both ambiance and cost. 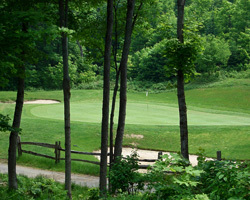 When planning that Muskoka trip this summer throw the clubs in and take a shot at Hunstville Downs. Your banker won’t mind, but your handicap just might.